When I finally decided to invest in a new cb radio for my truck, I had a number of features it needed to have. It had to be compact, inexpensive and easy to operate. A friend suggested I get the Midland 1001LWX cb. After some research, I finally bought it. I’m glad I did. Although I didn’t know much about cb radios back then, owning and using my little Midland cb has taught me a lot. That’s why I’ve created this Midland 1001LWX cb radio review. To share what I like or don’t like about this unit. My reason for opting for a small cb is I don’t like crowing my truck’s dash with unnecessarily large accessories. This Midland 1001LWX measures a mere 4.5 by 1.75 by 7.5 inches. Very few cbs in the market are that small. Installing this cb is also quite easy. All mounting hardware is provided and you won’t need any special tools to install the unit. The design includes a 40 channel digital tuner. It has several advantages. First, it makes scanning of active channels fast and easy. Second, it makes locking into my preferred channels easy. A cb radio with weather alert, the Midland 1001 LWX automatically scans and locks on the strongest weather channel signal around your location. This feature comes in handy when traveling and you need to have first hand information regarding the weather conditions around you. The Midland CB 1001LWX includes a number of features that make operating it simple. One feature is its design. All controls are placed on the front panel of the CB. The front panel also includes a back-lit LCD display which makes reading the unit easy even at night. The unit comes inclusive of a corded mic. The mic can be removed and replaced with a different one if you like. It’s also compatible with many of the CB radio antennas in the market. If you already have an external antenna mounted on your vehicle, it’s likely that this CB radio will work fine with it. I believe that a CB is as good as its ability to transmit and receive clear audio signals. This Midland cb includes a number of features which ensure that everything transmitted is received loud and clear. Some of these includes the RF gain control, Automatic Noise Limiter and squelch control. Initially, I found cycling through different NOAA weather channels a bit of a challenge. It requires manually pressing the PTT button on the mic which can be confusing for new users. Do not attempt to make any internal adjustments. Internal adjustments and/or modifications can lead to illegal operation as defined by the FCC rules and regulations, Part 95. They must be made only by qualified technical personnel. Illegal operation can lead to serious consequences. The CB market has many good products. Among these is the Midland 1001LWX radio. It’s a compact cb that will install in almost any type of vehicle without taking up a lot of space. It’s also a versatile unit that’s designed to work with a variety of different accessories including antenna and Cb mic. The sound is clear and operating it is quite easy. For the price I bought it at, I think it was a steal given that it offers many features you’ll find in more expensive units. I just bought mine today I use to own cobras but last 2 have been awful and last smoking in the dash, I like this midland so far but concerned if as powerful as the bigger units also my truck has this internal antenna system my rf gain meter jumps between 2 and 3 wondering if it’s the size of the cb or my antenna if an external one jumps it between 3 and 4 I’ll be satisfied ous bigger always better? I’d recommend using FireStik FG4648-B CB antenna kit for satisfaction. It’s my personal choice. I recently purchased the Midland 1001LWX . It is small, comparable in size to the Cobra 19 Ultra, maybe 1/2″ longer than the Cobra and just slightly narrower. For all intents and purpose, they are the same size despite the listed dimensions for both suggesting that they are not as close in footprint. 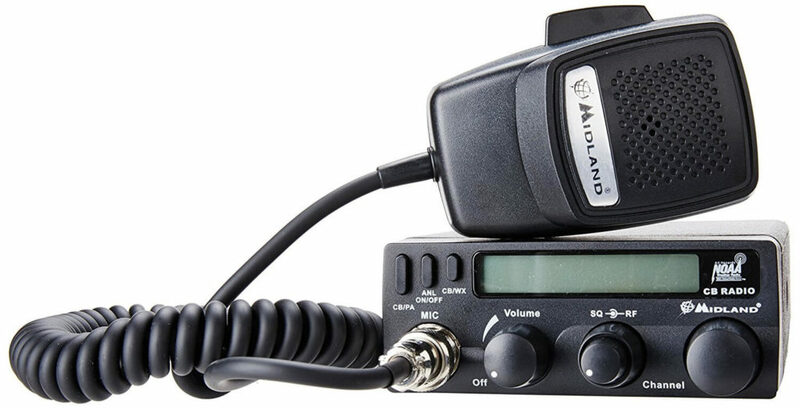 It is almost impossible to find a CB radio with as many features as the Midland 1001LWX in such a small case. Automatic Weather Scan feature can be a little fussy but I think it depends on, as always when dealing with radio systems, where you are in relation to the transmitting antenna and terrain. So far I have not had that much trouble with the feature and not enough to lower my overall rating of the unit. I decided to use an Astatic 636L Noise Canceling Microphone as I did on my other installed CB radios. The 636L comes pre-wired in a “standard 4-pin configuration” suitable for Cobra, Uniden, Maxon and some others. I ordered one re-wired for a Midland radio and found it did not work with the Midland 1001LWX. I tried using the included Midland microphone with my new Midland radio and it worked, proving the radio was fine. After using the Midland 1001LWX, I am convinced that Midland has released an awesome product. I feel that I got a good deal and that the radio is overall excellent value.